j: Finally heading to SE Asia: to Kuala Lumpur, known as KL, in Malaysia via a direct five and a half hour flight from Perth on Malaysian Airlines. Our shuttle van to the airport picked us up 30 minutes late, then drove around the 'burbs for another 15 minutes to pick up two more sets of passengers, then stopping at the domestic terminal first, then another 8km to the international terminal... bottom line, we arrived less than an hour before departure. The check-in line was non-existent, and the counter person gave us a free upgrade to golden (business) class since the flight was very full -- and, we surmise, thanks to h's suggestion we wore nice clothes, i.e. a collared shirt and long pants for me. Golden class was of course delightful, with way too much tasty food, seat-front on-demand video, and drinks refilled within a minute of emptying out a glass without asking for the refill like magic. Arriving very late in humid KL, we located an ATM in the airport to get some Malaysian ringgit (US$1 = RM3.8, or RM10 = US$2.63), the new fast train whisked us into town in 30 minutes for RM35 (US$9), then a quick taxi ride to Chinatown, which unexpectedly dumped us at some intersection because he didn't know where the hotel was. Luckily it was only 3 blocks away, much closer than expected since the map in our guidebook had it placed wrong. h: Okay, you've heard Jan's version of this, now here's mine. The shuttle was obscenely late and we were both a nervous wreck for 2 and a half hours while we were waiting to see if we'd even make our flight at all. The business class upgrade was merely compensation for the stress, in my opinion. And ironically it was really a bit unfortunate because it made for a brutal contrast when we finally climbed out of the taxi into the streets of Chinatown in KL. Giant cockroaches scattered as we wheeled our luggage along the raised sidewalks, dodging the grates of the open sewers but unable to dodge the smell. The room? No exterior windows and flourescent lights. In retrospect I'm not even sure it had a sprinkler system, although that isn't something you notice when you've dropped in out of the sky and there's so much else to be distracted by. Dirty floor but the bedding and such seemed reasonably clean, and the mattress was new. The attached toilet and bath facilities (for which you pay extra in rooms here in SE Asia) consisted of an elongated closet with tiled floor and walls. In one corner a sink desperately clinging as best it could to the wall, the opposing corner a western-style toilet that required a bit of coaxing to flush. In between was a hand-held shower nozzel and a water heater that apparently heats the water as it passes through - something like an electric tea kettle perhaps. Showering causes the toilet to get all wet, but apparently this isn't a major problem since there is no toilet paper to speak of, only a smaller hose below the shower nozzel that is intended for washing one's backside with one's left hand. Eating, perhaps you've heard, is done with one's right hand. We brought our own TP and were glad for it. Overwhelmed, we slept pretty well. 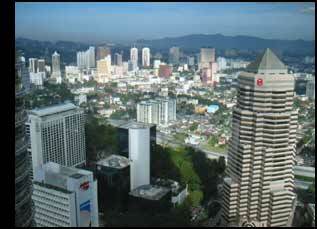 j: Kuala Lumpur. Well, since we arrived so late, we slept in until almost noon, which means our first meal was "brunch." We ended up at the Central Market, as it turns out only 2 blocks from the hotel, where we ate some Indian "buffet" (only to find out later I didn't fully read the guidebook, as the better Malaysian stalls were one floor higher). Not the greatest way to start the day in a new country. We walked up to the pretty downtown Jamek Mosque that sits on a confluence of 2 rivers, where Heather had to don a headscarf and I needed long pants. Welcome to a Muslim country -- also remember not to eat food with your left hand. The mosque seemed mostly full of people snoozing in the shade, for which it was admittedly well suited. We decided to hop on one of the local elevated light rail lines to see some more of the city, and ended up exiting the system north of downtown to hop onto a monorail line which it turned out was not yet completed. Grrr. So back on the light rail line, taking it to its southern end way out in the boonies, past hills and apartment buildings and a clump of sports/arts stadiums. We definitely got to see more of the city than the downtown core this way (thanks to Heather for that suggestion). We took a train back to the new KL Sentral train station (sic), and walked back to Chinatown from there, going mostly along highways and industrial areas, and looping further out of the way than planned. Serendipitously we ended up at a Chinese temple past the opposite edge of Chinatown from our hotel, which turned out to be quite ornate with dragon motif. At this point it also became unbearably humid, and I finally gave in and unzipped my pant legs - Muslim men don't really wear shorts. After a short walk back to the hotel for a shower, we headed out for in Chinatown and picked one of the many restaurants with outdoor street-side tables, lured in by the "steamboat" dinner, also known as Chinese fondue. 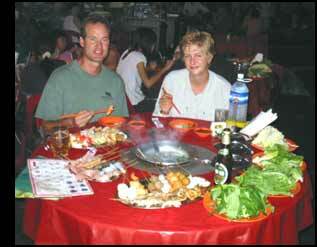 Basically you get a couple of plates of skewered meats and seafood, as well as some plates of greens, which you cook in a boiling broth in the sunken pot in the centre of the table. In the end you pay by the number of skewers left over with only the prawns and mussels at a higher price and the number of plates of greens you touched -- which we weren't told ahead of time, so we foolishly took some from each plate, thinking it was included. The dinner was quite tasty, and certainly recommendable. As for the national Malaysian language, Bahasa Malaysian, it was reasonably easy for me to pick up some words and phrases, since they use our alphabet, the pronunciation is straightforward and similar to English, and verbs aren't conjugated. For example, "thank you" is "terima kasih" which sounds like you think it would, except that the "a" sounds more like the "u" in cup. Additionally, most people speak English anyways. h: The first meal - the Indian buffet? - was nothing short of frightening. We knew one of the dishes was calamari but it was an outrageous color from the spices and the rest we didn't recognize. I ate as much rice as I could and pushed the rest around on my plate. Between this and the room... I was wondering what the hell I had gotten myself into. 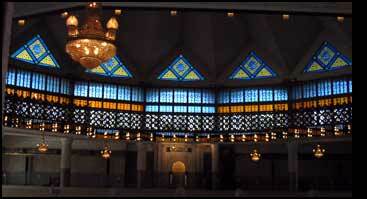 The Masjid Jamek that Jan described was a bit more of an experience for me. We were standing outside the gates and I was fussing because I had worn and long skirt and long-sleeved shirt but had no headscarf. Turns out they have loaners for foreign women so they can also see the mosques. A four-foot-tall man in black, all teeth, smiled and waved us to come inside. As he gave me the scarf and I tried to figure out how I was supposed to tie it on my head he asked me where I was from. America, I told him. Oh, America? he said? Do you like it here? I said I liked it very much and thought it was very beautiful. A lie at this point, but what else could I say. Now being a woman I hadn't expected him to address me directly in the first place, but what he said next took me completely by surprise. Al Qaida, he said, you're not afraid to come here? Al Qaida? I was stunned and didn't know how to reply. I mumbled something like, no, I think it's very beautiful here and smiled a lot. I had anticipated that being American I might encounter some hostility from the Muslim people here - it is, afterall, the predominent culture. I was already trying to sweat my way into their good graces by wearing long clothing to be as inconspicuous as I could in spite of my blonde hair and height. I had imagined what I might say in response to some more hostile comments about current American politics, but I had not prepared any responses to a question like this, one of curiousity. Especially coming from the mouth of a man whose face was at waist-level. Things shifted after this and I started to lose interest in my own initial squeamishness of the room, the food, the sidewalks even. In its place was an impression that there were much more interesting things to contemplate here in Malaysia than sanitation. h: We did not make it to the towers because I woke us both up at 5am screaming because I thought I'd seen and felt a huge spider crawling on my hand in the bed. Having spooked Jan with my screams, we tore the bed apart but found nothing. The spider I'd imagined I'd seen was the size of a tarantula which was absurd - in this room despite the dirty floors we had not even seen so much as a small cockroach much less giant arachnids of the jungle. But the image still hangs out in my mind and I have to wonder what it means. I am inclined to think it inauspicious although I don't know what spiders mean symbolically in dreams or otherwise. I hesitate to call it a dream really because it was and still is such a vivid image in my mind. The history museum was marginally interesting but the Museum of Islamic Art was pretty spectacular. I can't say that most of the art was to my taste per se, but the building itself was a stunning combination of traditional arabic elements combined elegantly with glass. I say the museum was spectacular even though it was not to my taste because apparently the whole concept behind a museum of Islamic art is, well, difficult at best. In Islamic culture, imagery and art for the sake of self expression are considered idolitrous. Resultingly, the universal desire to express oneself has emerged in a manner far different than art of western or even far eastern cultures. Most items on display were domestic or utilitarian and the decorative elements tend to employ elaborate geometric patterns, arabesque/floral design, and/or calligraphic quotations from the Quran in various manners of Arabic script. To the western eye these themes seem redundant, busy, and boring. But standing in the knowledge of the circumstances under which these themes arose begins to bring them to life. In addition to these themes, the exhibit on mosques and the structure of the museum itself demonstrated how light and shadow are also powerful themes in both art and architecture in the Muslim world, light representing unity with God. The museum itself is seated across from the National Mosque of Malaysia and the exterior walls of the second floor facing the mosque have been done entirely in glass. This allows for a view of the gardens of the National Mosque but it also creates an intense contrast between the pure white light of the outer room and the shadows of the interior climate-controled rooms where the exhibits are housed. j: This time we set an alarm to get to the twin Petronas towers early enough to receive some of the 800 free daily tickets. These let you go up at a designated time for exactly 10 minutes to the skybridge that connects the towers at the 41st floor. The towers are about 85 stories tall, but cheat in that the top 10 stories worth are a "permanent fixture" tower, which to me looked like a large flagpole and base. Bottom line is, the top office floor is slightly lower than a handful of other office towers around the world, so you be the judge. Afterwards, lunch back at the Central Market in Chinatown was delicious, as we went to the recommended top-floor Malaysian food stalls. I took a little more time to learn some of the menu words with the most helpful staff. The only downside was that it was outside, albeit covered, and very hot and humid, unlike the air-conditioned area below. But the food was tasty. In the afternoon we walked over to the Lake Gardens which included an orchid garden, a planeterium with a mock Stonehenge in front, and lots of monkeys cavorting in and beside the road, including one sitting on top of a monkey street sign -- something you usually never see together, like deer by a deer crossing sign back home or a wombat near a wombat crossing sign in Australia. We tried to book the "jungle train" to Kota Bharu in the north-east corner of the country, near the Thai border, but were told that we could only buy tickets if they originated in KL, which would have meant an insanely long train ride -- we had hoped to take a bus or share taxi to a train-station town that was across the hills, instead of taking the train on a big southern loop first. 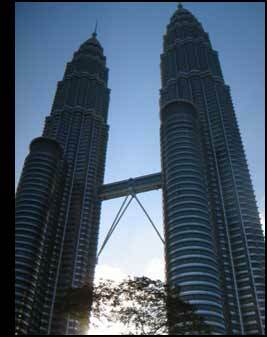 Trains, the guidebook says, are not the best or fastest way to get around Malaysia. Instead we booked an 8-hour long-distance express bus for the next morning, for luckily the national bus company had a ticket counter in the train station so we didn't have to trudge across town. Interestingly there was a Starbucks in this train station where prices for lattes and mochas are almost as much as back home (unlike the much cheaper cups of coffee around town), and while the gal working there told me there were at least two dozen Starbucks in KL, we never did see another one. h: The towers were by and large not all that exciting for me; the 41st floor is still 16 floors shy of the wild ride I took on Floor 57 of Key Tower during the earthquake in Seattle a few years ago. Built by a petroleum company who put a four-level shopping mall in the base of the structure, these towers remind me of giant capitalist phalluses shooting up out of the earth, dark and metallic like the petroleum geysers that paid for them. The stainless-steel exoskeleton is cool but one can't help but look around and think the money could have been so much better spent on more basic infrastructure. I guess it also reinforced an opinion that had been gradually developing over the last few days; the whole place seemed to reek of propaganda, or PR as it is called in less fascist countries. When you look around on the streets, on the public transportation, in the stores... everywhere you see three prominent cultures threaded amongst each other in apparent harmony. Women walk the streets in traditional Muslim dress and headscarf, as well as georgeous Chinese tunic and pants, exotic saris of India, and typical western attire. It's perhaps a travel-writing cliche but it seems that all of these cultures exist in relative peace and tolerance. But when you visit the museums, even the Islamic Art Museum which I liked so well, and then these towers, I got the impression that it was very staged in many ways for visitors and that behind it all most Malaysian people live in third-world conditions while the government tries to claw its way into the 21st Century. I've given this some thought and my final assessment is that these museums and tourist attractions are intended to present Malaysia as a tolerant, throughly-modern, democratic country that is part of the global economy. We as visitors are intended to see only this side of Malaysia and as a westerner from a first-world country I am highly suspicious of something so obviously contrived. But in reality, the effort that has been put into this PR campaign is tremendous and that in and of itself says something. It is easy to criticize struggling nations as we in America have an economy which can afford expensive environmental policy and labor laws. Still, in order to achieve what we have as an economy and a nation we turned the skies black and subjected our factory workers to 14-hour days. I do not mean to imply that this is necessary or excusable, but more simply that as an American I am hardly in a position to criticize. 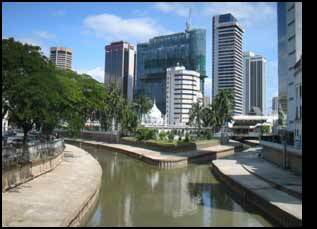 Unlike so many other predominently Muslim countries, Malaysia seems to be working very hard to be part of both global economy and culture. I do not like the tactics, but I do respect the effort and intention. On our hotel-room TV, Jan and I watched the World's Strongest Man and the World's Strongest Woman competitions held in KL sometime ago. Although clearly dated reruns and containing no Asian contestants at all, these programs were broadcast over two nights during prime time on a Malaysian television station. Looking around, I can't even imagine who they would have found as an audience for such a thing and indeed the audiences on the sidelines looked somewhat sparse. For the American viewers that watched these games when they were originally broadcast abroad, perhaps it was the first time they had even heard of Kuala Lumpur. But for Malaysian viewers watching these reruns it is a message of progress, the brute force of a government pulling the country on a tow-rope into the 21st Century. j: Bus to Kota Bharu. A long 8-hour bus ride, with a mid-way lunch/restroom stop. At least it was air-conditioned. And there was decent leg- and elbow-room, since we opted for the "business class" bus for an extra dollar and a half each, meaning there were only 3 seats per row and rows were spaced further apart. Actually we had more room than in an economy class airplane. Interestingly, this 8-hour cross-country bus ride actually cost slightly less than the 30 minute express train from the airport into KL. Go figure. The scenery was quite nice, through hills and jungle, past rock outcroppings that went straight up for hundreds of feet, through little villages, yadda yadda yadda. 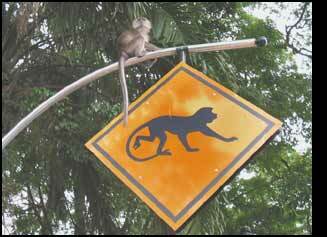 Our destination, Kota Bharu, is the last city or even decent-sized town before the Thai border. Even before I had disembarked the bus at the downtown local bus station, taxi drivers and touts were clamouring for my attention. Our hotel was forgettable, and certainly not as "spotless" as the guidebook said. Comfortable enough I guess. 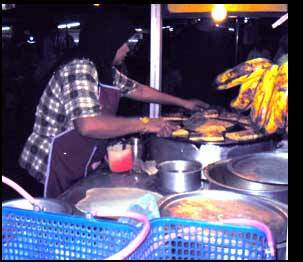 We ate dinner at the nearby night market, where the banana pancakes were most memorable and, alas, not available anywhere the next morning. h: I had just recovered from the shock of KL and was getting used to, well, things, when we took off for Kota Bahru. The bus ride was fine and the scenery was georgeous in parts but arriving in Kota Bahru made me want to crawl under a rock. Jan mentioned that people were trying to get his attention for taxis and hotel even before we got off the bus but while he was fending off a few the rest of the entire bus station was STARING at me. Again, as if being tall and blonde and foreign wasn't bad enough, I was the ONLY woman as far as the eye could see whose head was uncovered. Gone were my grandiose theories of Malaysian tolerance and acceptance - I wanted to find a hotel room and HIDE as soon as possible. The stares were not malicious particularly, nor were they curious, they seemed to be merely what one does when something odd has attracted one's attention. But that much scrutiny is something that few of us are accustomed to and I began to see what the guidebook meant about foreign women sometimes feeling "uncomfortable" in these parts of Malaysia. We put our things in the room and went out again at dusk to forage for some food. The best bet, recommended by the guide book was this night market and when we first arrived in the square it was closed because it was prayer time. We sat on some steps in the breeze and listened as the evening prayer was sung over a loud-speaker into the city; strange disonant words and melody to our western ears. Across the square a cluster of trees screeched and dark shapes fluttered in the dim light as bats left their roosts and birds found theirs. The low prayer hymn and cacaphony from the trees made us feel as though we were even farther away from home than we imagined, in a exotic land that one only reads of in adventure travel stories. It was a moment of peace and serenity. j: Very quiet here, almost no foreigners, but then again, it was low season -- even the cultural centre with its free performances was closed for another month and a half. At the tourist office, which in Malaysia seems to be always be staffed by women with marginal English and not really that much information, I signed the log book and noticed that a Japanese couple had been in earlier that morning, but the previous tourists popped in 3 days ago! We wanted to go to an island just down the coast, or maybe some beaches, but the tourist office said the ferries weren't running due to the monsoon, and that the local beaches weren't worth going to. I took a look in the token museum, but by and large there was not much to do here; plus the weather was cloudy. We decided to hang out and head to Thailand the next day, especially since our ringgit were running out, and we weren't going to be around long enough to make it worthwhile going to an ATM. After a full day on the bus, a day to relax was quite appealing. I picked up some fruit, of course, from the local market where a nice younger woman let me sample a few different fruit for free, including round brown longans with their grape-like flesh; in the end I bought tasty sweet bananas, purple mangosteen with its tasty citrus-like juicy white flesh, a bumpy red fruit whose name I forget (anybody recognize it? 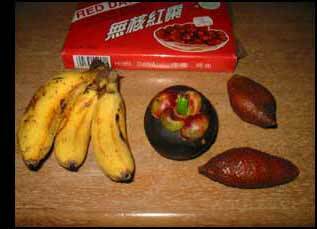 let me know) that tasted both sweet and sour to nice effect, and lastly a box of unexciting red dates from the store. h: I hid in the room while Jan mucked about town. I read my books, and it was good. Next country: Thailand (previous country: Australia).